Our eSport club extends today to a whole new game with the arrival of TrackMania 2 Stadium players. Omar “softyB” Benabdallah is managing the team, which includes Valérian “Papou“ Ramamonjy, Aurélien “Aurel” Bouard, Côme “Cocow” Marquet and Tanguy “Cap” Renaud. These four riders have been playing together for a long time, some knowing each other for more than two years. They were part of famous organizations such as LDLC or aAa and showed their strengths on the international stage. 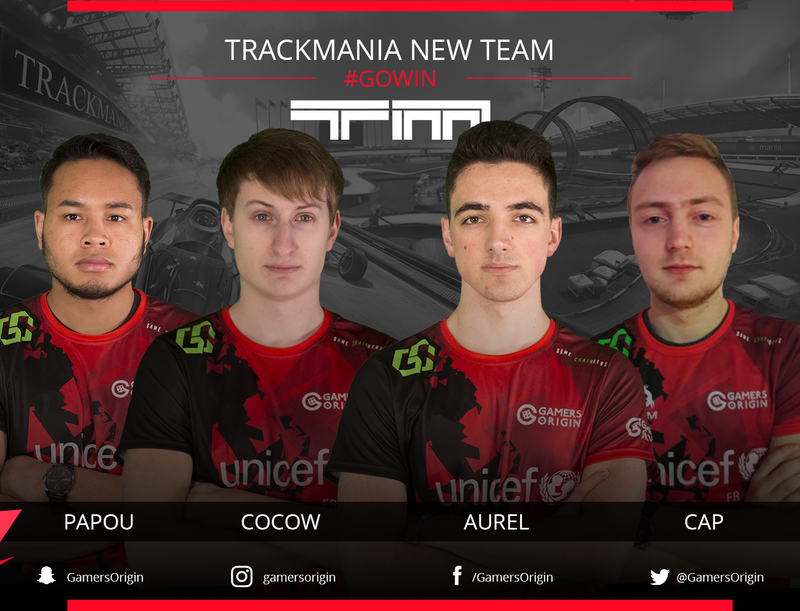 They achieved excellent results in ESWC, Trackmania Pro League or TrackMania Cup organized by the well-known French streamer Zerator. For instance, Aurel won the ESL Premiership in 2017 as Cap did in 2016, Papou claimed the Virtual Lan in June 2016 while Cocow achieved a top 2 in Pro League in November 2017. The TrackMania scene is really active with lots of LAN competitions and online events such as the Pro League. The community and the fans are truly supporting the game and their favorite players, as can be seen in live events. Our new recruits will play with our tag for the very first time this weekend during the Gaming WinterFest in Melun. Then, they will try to claim the Gamers Assembly title in March in Poitiers. Meanwhile, Cocow, Cap and Aurel will take part in Pro League playoffs while Papou will play another tournament of the same kind #GOWIN. Joining an organization such as GamersOrigin is an honor and an incredible opportunity for us. Playing TrackMania with the jersey of one of the most prestigious French eSport club is a challenge we must face. The friendly environment convinced us to do our very best in the next events. We have high ambitions: confirm our position on the French scene and continue to progress on the international one. We also want to develop TrackMania eSport and it begins this weekend during the Gaming WinterFest !